We’d love your help. 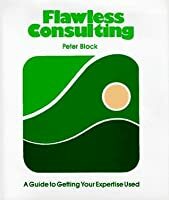 Let us know what’s wrong with this preview of Flawless Consulting by Peter Block. The second edition of the "consultant's bible" is here! For over fifteen years, consultants--both internal and external--have relied on Peter Block's landmark bestseller, Flawless Consulting, to learn how to deal effectively with clients, peers, and others. Using illustrative examples, case studies, and exercises, the author, one of the most important and well known in his The second edition of the "consultant's bible" is here! For over fifteen years, consultants--both internal and external--have relied on Peter Block's landmark bestseller, Flawless Consulting, to learn how to deal effectively with clients, peers, and others. Using illustrative examples, case studies, and exercises, the author, one of the most important and well known in his field, offers his legendary warmth and insight throughout this much-awaited second edition. Anyone who must communicate in a professional context--and who doesn't?--will use the lessons taught in this book for years to come! "Who would have thought the 'consultant's bible' could be improved upon? 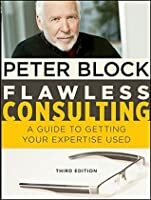 Count on Peter Block--the consulting profession's very own revolutionary--to push us to confront and struggle with the paradoxes inherent in our work." "Block has distilled years of experience into a wise, down-to-earth, and eminently practical guide to excellence in consulting. If you are new to the practice, Flawless Consulting will chop years off your learning cycle. And even if you're an old pro, Block's insights will elevate you to new levels of effectiveness. Flawless Consulting is not simply about becoming a better consultant; it is about using consulting as a path toward becoming a better person." To ask other readers questions about Flawless Consulting, please sign up. Since Goodreads lost my old review while trying to upload it, I'll give you this. I think Block focuses a lot more on being blameless as a consultant than on being effective. I agree in principle with lots of what he says, but the overarching idea was the downfall of this book in my eyes. I can't stand the kind of advice that admonishes well-paid experts to constantly deny their responsibility for the outcomes of projects and to distribute the blame for their projects by coercing everyone in the Since Goodreads lost my old review while trying to upload it, I'll give you this. I think Block focuses a lot more on being blameless as a consultant than on being effective. I agree in principle with lots of what he says, but the overarching idea was the downfall of this book in my eyes. I can't stand the kind of advice that admonishes well-paid experts to constantly deny their responsibility for the outcomes of projects and to distribute the blame for their projects by coercing everyone in the organization to "participate" in discovery and design (thereby implying that the attendees agreed implicitly to the design of the project by not being vocal enough to shoot the project down). A number of years ago, I found myself without a job for the first time in my adult life. At 40, this was scary until I woke up one morning, created a subchapter-S corporation and became a consultant. This book, along with others by Peter Block, was a significant help in getting started and having the confidence to persevere for two years independently. Now I'm a consultant in a big four firm and the things I learned from this book still ring true. This is an amazingly comprehensive "manual" to consulting. It covers techniques in detail while also discussing mindset and sharing recommendations. The author's focus is on the process of consulting. The title is derived from this process view: If you followed the process, then you consulted flawlessly, regardless of the outcome. Therein lies a seed of humility: As consultants, we learn, advise, recommend, and encourage action - we do not have the power to guarantee outcomes. For all the wisdom i This is an amazingly comprehensive "manual" to consulting. It covers techniques in detail while also discussing mindset and sharing recommendations. Read it for work. Decent, relevant to the work we are doing, but not life changing. I picked up a public policy capstone class to teach this semester and this book was suggested for the students, who are doing consulting projects for government entities (cities, counties, state agencies, etc.). It's fine book, has good basic material and a website for checklists. My primary concern is it is way too expensive (over $60 for a hardcover) for pretty basic information. There isn't anything here you couldn't find elsewhere online. 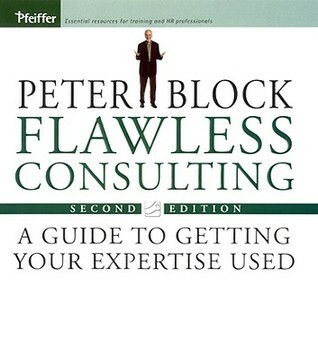 I have to admit that I really liked Peter Block's "Flawless Consulting". This book was originally written in 1978, and then revised in 1998. I expected the book to be dated and irrelevant, but it wasn't. The concepts that Block wrote about many years ago are still very much applicable today. Having been a consultant for 6 years, I especially liked this book because it focuses on the style of consulting I like (or rather liked!) to do -- improving the capability of the client to find and implemen I have to admit that I really liked Peter Block's "Flawless Consulting". This book was originally written in 1978, and then revised in 1998. I expected the book to be dated and irrelevant, but it wasn't. The concepts that Block wrote about many years ago are still very much applicable today. Having been a consultant for 6 years, I especially liked this book because it focuses on the style of consulting I like (or rather liked!) to do -- improving the capability of the client to find and implement his/her own solutions. I was especially impressed by the emphasis Block places on how to establish a relationship with the client, as well as defining the assignment. Consultants love to define assignments, but often don't give much thought to the relationship. The book is also well balanced between the needs of those who are internal consultants as well as external consultants/experts. A great strength of the book is that there are extensive examples of the same issue so that you can get a good perspective, even if you don't yet have much experience as a consultant. So it is a terrific book for those who are new to consulting. For those of us who have had consulting experience, there is still a lot to learn. The questions and checklists Block provides throughout the book are practically a book by themselves. They are very well designed and address the most important issues. What I especially found useful were the extensive list of ways to diagnose what may be going wrong when the client asks questions or is inactive. I found even more useful the many ingenious responses to those situations that had never occurred to me. I have stumbled into a few successes in my consulting career and can look back and see it is because I applied the concepts of this book - whether by design or accident. Conversely, I can also see some other situations where the application of these concepts would have been very useful. Block strikes a perfect balance between theory and execution. In fact, there is a lot of both. He backs up his theories with flowcharts, checklists, and even cartoons. This book is the real deal. Block clearly knows what he is talking about when it comes to organizations and the consulting process. There is no doubt you will be a much improved consultant or manager if you learn and apply the methods in the book. Truly a classic, and a "must have" for anyone who consults, or who hires consultants. So far so good, and I think this book is written for professionals who already have competencies for working with people in consulting. I also think if you want to read this book keep in mind this book has a companion book too! The Flawless Consulting Fieldbook & Companion A Guide To Understanding Your Expertise. Peter Block, who has focused attention on consulting skills, empowerment processes, and reclaiming our individuality. As these books will guide a professional to know all the stages So far so good, and I think this book is written for professionals who already have competencies for working with people in consulting. I also think if you want to read this book keep in mind this book has a companion book too! The Flawless Consulting Fieldbook & Companion A Guide To Understanding Your Expertise. Peter Block, who has focused attention on consulting skills, empowerment processes, and reclaiming our individuality. As these books will guide a professional to know all the stages and adhere stictly to them to be successful as a consultant. You will be able to assess your own abilities to these competencies even as a beginner. It does take time to become an expert in the field, but it will be worth knowing that you can help others help themselves. I just finished this book and found that it is a very good approach for consulting, but I also found a better author for consulting Schein. I will give a review but compared to both it is the approach that counts when dealing with clients. The six steps in Blocks book are closely related to Schein's, after all there are basics to consulting or even coaching. Completing (feedback) the requirements of each stage; continue with process plan; Block calls this last step Extension, Recycle, or Termination. If a consultant fails at one of these steps (Schein agrees) then the client will lose confidence and trust. Also, failure brings not being authentic it is a lot better to turn down the work if there are no competencies. If one does continue on then the chances are you will either be asked to leave, never will have the chance for future projects (this is the heart of consulting to return to the same clients) this build rapport and leads to other work. I wish I could give this book five stars--is has that much good content. But it's so formal in style that it reads like a textbook. It's a really, really good textbook, though. If you're someone who helps other people solve problems, whether a traditional consultant or a coach, a teacher or even a leader, then this book has rich insights for you. Be patient and read slowly. Each paragraph has as much content as some chapters do in other books. It will be worth it. If you're already an experienced consultant I'm not sure how useful it would be, but it is a great overview/introduction to the field (and free of "execuspeak"). From the dust jacket: "Flawless Consulting affirms the notion that authentic behavior and personal relationships are the key to technical and business success." That's really the book in a nutshell. Not that that isn't a valuable insight. But you can save yourself a bunch of time by not reading the book, because the book mainly restates that premise over and over again using every combination of words the author could think of to say basically same thing. The author makes the case that people ar From the dust jacket: "Flawless Consulting affirms the notion that authentic behavior and personal relationships are the key to technical and business success." That's really the book in a nutshell. Not that that isn't a valuable insight. But you can save yourself a bunch of time by not reading the book, because the book mainly restates that premise over and over again using every combination of words the author could think of to say basically same thing. The author makes the case that people are emotional creatures, and as a consultant, the best way to approach clients is to build relationships in order to build trust. And the author makes the complementary case that the wrong way to approach clients is to diagnose their problems rationally and explain to them what they need to change in order to be more successful. This is an important insight, and probably more true today than at any time since the beginning of the Enlightenment. If you successfully engage with the client at an emotional level, the client is less likely to view you with resistance. But then the author undermines his premise with chapters on healthcare reform and education reform. Not that these systems don't need reform, but the author posits that Flawless Consulting is the answer to what ails these systems, and recounts a doctor and a high school teacher who claim to have used this book to reform their respective institutions. Color me skeptical. For one thing, the surgeon was apparently fired, because the healthcare system just wasn't ready for the greatness of Flawless Consulting. The teacher changed the paradigm to put the students in charge of their learning. "This is based on the reality that successful learning is random discovery." The teacher told the students, "If you are tired, take a nap." Tests are bad, because students become "performers" rather than "learners." In this model, the teacher doesn't teach, but is rather a consultant, and the student is a self-directed adventurer, encouraged to fail often, "since if the goal is learning, failure is a big way it happens." One hopes that none of these students are surgeons or engineers today. These two chapters then cast the rest of the book in a different light. In an Enlightened world, the consultant would engage with clients in a rational, analytical way, diagnose their problems, and present solutions based on evidence and logic. The author makes the case that people are by and large too emotional for that. Better to focus on building relationships, and be authentic, and that's really all the consultant has to do. The client will then magically become successful. "The world will provide the events that will force movement. Life provides the disturbance. We do not have to induce change, drive it, or guide it. All we have to do is join it." The consultant doesn't need to teach or advise or be any kind of motive force. "It will be enough if we simply show up." This manner of consultancy may work in, say, social services, but organizations that build bridges or airplanes might want to think hard before taking this leap of faith. It may be better to sum up the book this way. There are people in this world who are analytical thinkers, and can be approached in an analytical, rational way. Then there are people in this world who are emotional thinkers, and who need to be approached in an emotional, "authentic," relationship-based way. And there are many people in between who can be rational, but really only after engaging with them to build relationships first, and then approach them with rational thought and analysis only after trust has been established. Therefore, it's safer to start by approaching everyone in a relationship-based way first. Okay, fair enough. In a way, it's an indictment of our educational system that people are apparently not taught to be approached in a rational way (as can be seen today on college campuses), but rather have to be coddled emotionally until a friendly relationship is established before a rational thought might be floated toward them. Which would indicate that real education reform might actually be the opposite of what the author is promoting in this book. "Seek for 'Power with' instead of 'Power over.'" "If you cannot say 'no,' yes has little meaning." "Manager reassurances do not help because it is a manages job to issue them." When we come together with a group we put a lot of preparation into presentation but participation is an afterthought. This should be the reverse and participation will have far greater impact and staying power with those involved. This is true in business engagements, facilitation and church lessons. "Resistance is a sign that something important is going on." Don't define people by work they can't do, define them by what they can do. There is often more teaching than learning going on in our instruction sessions. Find ways to shift the focus. Practical to a T, if you can get around the really bizarre reading style, this is a great first foray into contracting and independent consulting. Covers a lot of important topics like how to size a project and discuss contract deliverables, how to gather information when embedded in client space, and how to direct conversation productively and hear the "indirect messages" made by what is not often said. Sort of like a guide to being shrewd in corporations. This would be helpful for people both i Practical to a T, if you can get around the really bizarre reading style, this is a great first foray into contracting and independent consulting. Covers a lot of important topics like how to size a project and discuss contract deliverables, how to gather information when embedded in client space, and how to direct conversation productively and hear the "indirect messages" made by what is not often said. As an organizational consultant, this book was enormously valuable to me and reflects quite a bit of what I see to be true in my work. Consulting is really the 'how' of my work, while organizational diagnosis is the 'what.' Diving into the process of partnering with clients to surface and reflect back challenges and opportunities is fascinating (yes, I am a nerd -- but anything that helps you take more of an objective look at your day to day can be!). Block also makes it approachable, if a bit r As an organizational consultant, this book was enormously valuable to me and reflects quite a bit of what I see to be true in my work. Consulting is really the 'how' of my work, while organizational diagnosis is the 'what.' Diving into the process of partnering with clients to surface and reflect back challenges and opportunities is fascinating (yes, I am a nerd -- but anything that helps you take more of an objective look at your day to day can be!). Block also makes it approachable, if a bit repetitive and somewhat overly flattering about the role/impact a consultant can have. O conteúdo é valiosíssimo e foi resumido muito bem no apêndice (que pode servir como um guia de campo). A leitura é densa e tive a sensação de que a tradução para o português não contribuiu para a fluidez do texto. Recomendo para quem está iniciando em consultoria e para todos os que precisam promover mudanças em seus contextos atuais. This book I found a little dry. It was hard for me to stick with it. But like every book there was value. Insights I had not thought of and refection on my one exprrence and ways to do things differently. I really enjoyed this book. The practical aspects of it were very helpful in what I can do going forward. Pretty decent book on being a good consultant. Great for beginners, it really needs an update. Organizations have changed since this was written. Super useful book on how to change the conversation in your work environment. Who should've thought that consulting is basically family therapy? The textbook for my management consulting course. Not bad, but I'm sure glad I was an English major for undergrad. This book is as much about cultivating healthy, authentic, reciprocal adult relationships as it is about consulting. There’s a lot of down to earth wisdom here. A general consulting book. This book has sections about industries such as management, technology, health care, and education. Because numerous industries are covered, the methods are more generalized than may be wanted for specific scenarios. For example, technology consulting requires some fairly fine tuned methodologies that stem from computer science disciplines and technological implementations. With that being said, learning how consulting in different disciplines and industries compare is A general consulting book. This book has sections about industries such as management, technology, health care, and education. Because numerous industries are covered, the methods are more generalized than may be wanted for specific scenarios. For example, technology consulting requires some fairly fine tuned methodologies that stem from computer science disciplines and technological implementations. With that being said, learning how consulting in different disciplines and industries compare is a decent way to develop some business knowledge. For example, problem solving in medicine is labelled as diagnosis, while in technology it is called troubleshooting and repair, or testing and debugging. All are focused on solving specific problems, yet the information and methodologies differ greatly. A large amount of the book was also focused on client interactions. Namely, strategies and procedures for gathering information, drafting contracts, and working with varying levels of client participation were described. Means of preventing project failure were given, and client relations were described in numerous social and organizational contexts. I did notice the author used a large amount of negative terms, such as describing managers as experiencing agony and pain whenever minor business problems occur. I had the impression the author often tried to gain negotiation leverage through references to the nervous system and negative emotional spectrum. As if his services would also fix the negative emotion or feeling. Although slightly humorous, I didn't think this a good technique for getting the job done, and such language would most likely damage client relations and reduce repeat business. As a contractor/consultant on my second long-term assignment, this title caught my eye and served for listening on the commute. Overall I was impressed. Much of what is presented is common sense and deals with the simple themes of professional and personal integtity. To put it simply, it focuses upon those things you can control as a consultant and provides a basis upon which to minimize the things you cannot control. Success can only ultimately be measured by the things you control. Clients have their own agendas, their own goals and their own motivations that may or may not result in "success" on your end. If on the other hand, you find value and derive satisfaction from the things you can control; namely your effort, your integrity, your truthfulness and your end product, then you will be able to succeed and can even perform flawlessly regardless of the ultimate outcome. If you can focus on those elements and find your satisfaction there, you can make any assignment a success even if in the end your recomendations are rejected or altered. These are basic principals that apply in many settings and relationships. It is refreshing to see them applied here and the reminder and power of these combined with the practical suggestions were powerful and valuable. As an audio book there are a few technical shortcomings which are why I give the work 4 stars instead of 5. The narrator is good and keeps the delivery well paced and easy to listen to. The discs however do not end with a message that the side is finished and to change the discs. I found that annoying and started listening to the side again. I suspect the masters from cassette tapes were used and then not remastered for this format and it was a shame for a quality book to be diminished by this lack of attention and care to such an important element. I found it ironic given the emphasis on excellence portrayed in the book. Wiley should have perhaps listened closer and focused on their own excellence in that regard.